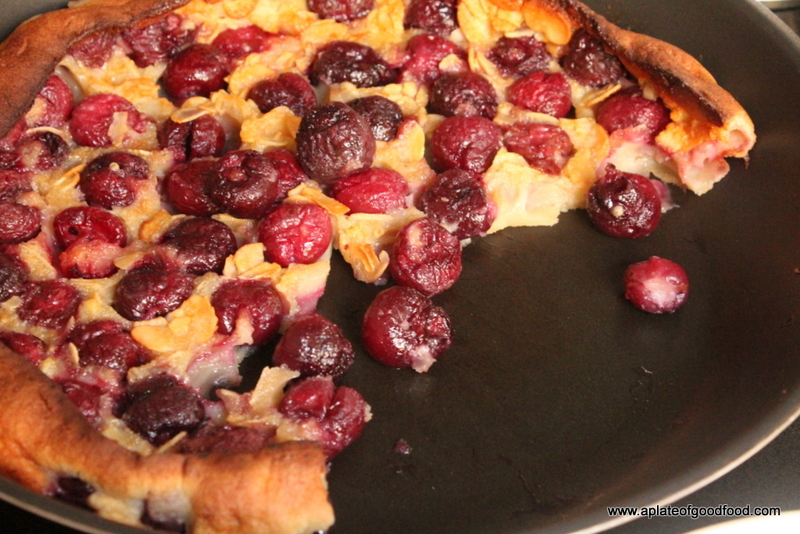 I have always wanted to make a clafoutis. 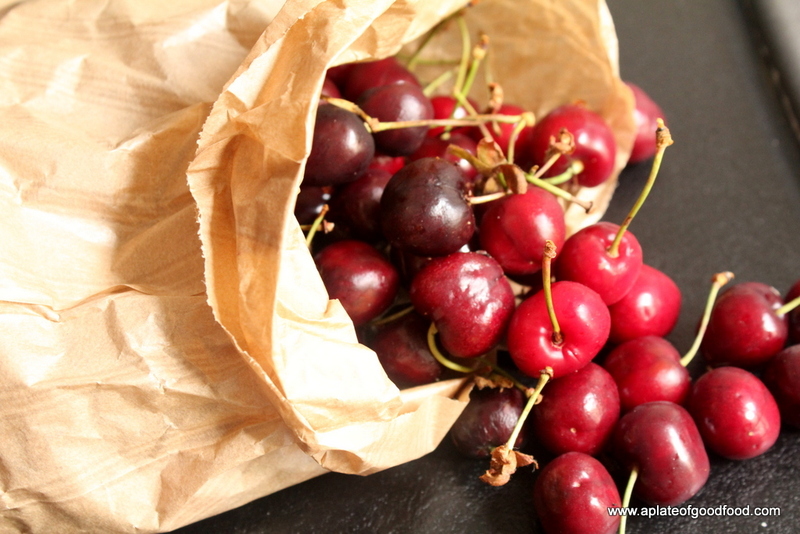 So when I spotted ripe red glossy cherries at the local market here, I knew this was the right time to try out one. 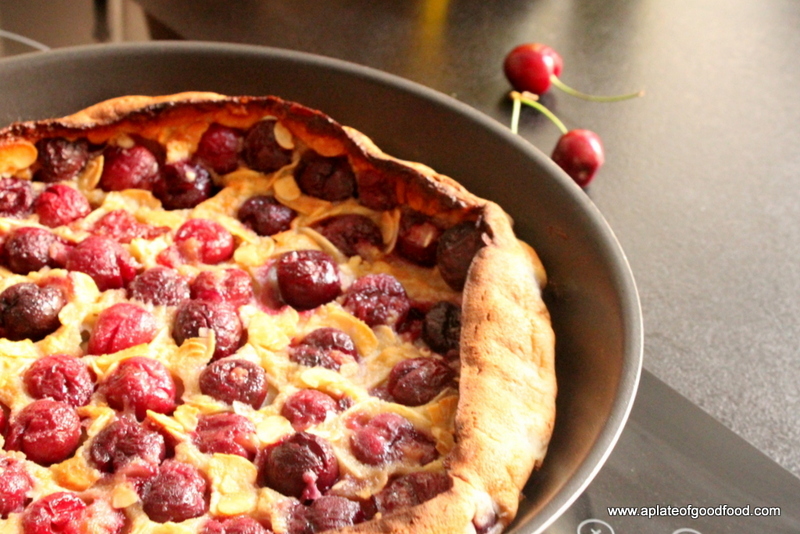 Since my first visit to the market and local vegetable/fruit shop in our area, I’ve been eyeing these cherries, so last weekend, I got a bunch determined to finally make a clafoutis. 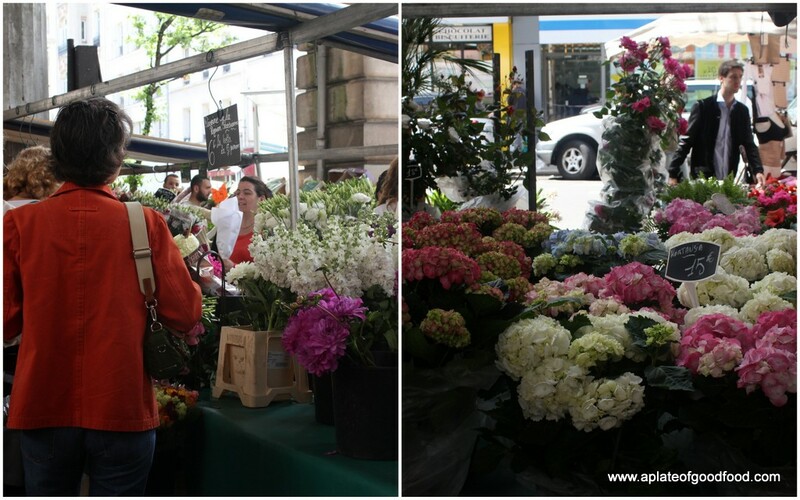 Visiting the market twice a week has become something of a habit now even if only to walk around and admire what’s on offer. 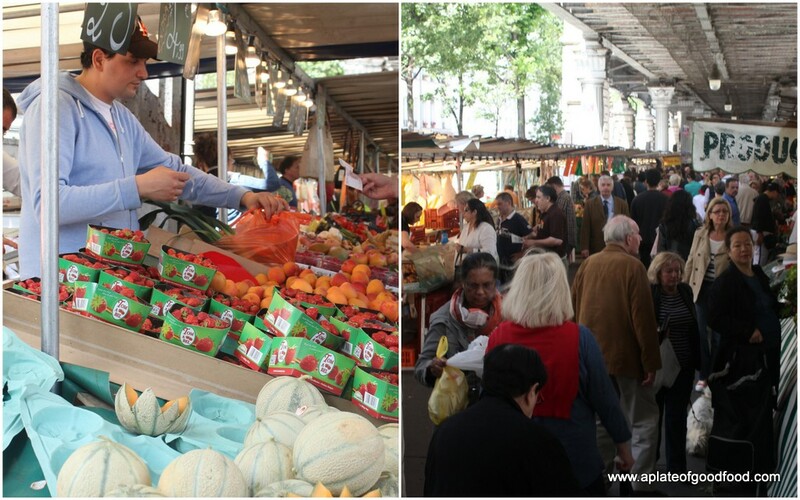 The bustling stands are always full of fresh vegetables and fruit along with a good variety of fish and meat not to mention the baked goods and roasted chicken stands. 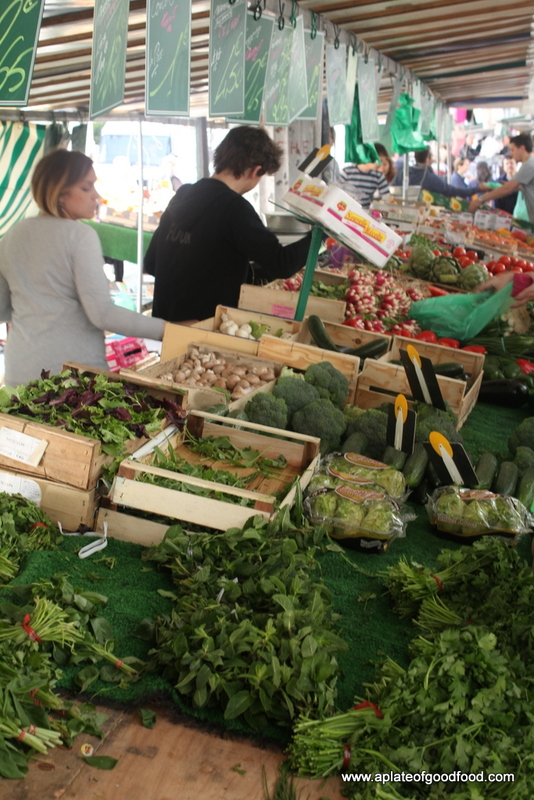 Enough to make your mouth water and give you inspiration for a home cooked dinner. After much research, I decided to use this Nigel Slater recipe for guidance. 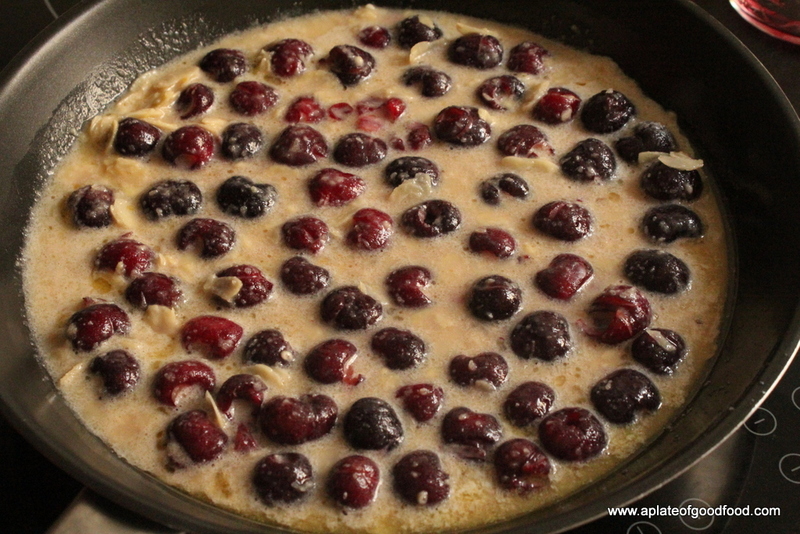 There’s only one small rectangular baking tin for the oven here, so I decided to make the clafoutis in a frying pan instead (luckily the one pan we’ve been supplied with has a heavy base and a metal handle suitable for the oven). I also threw in some sliced almonds to add some extra flavour. 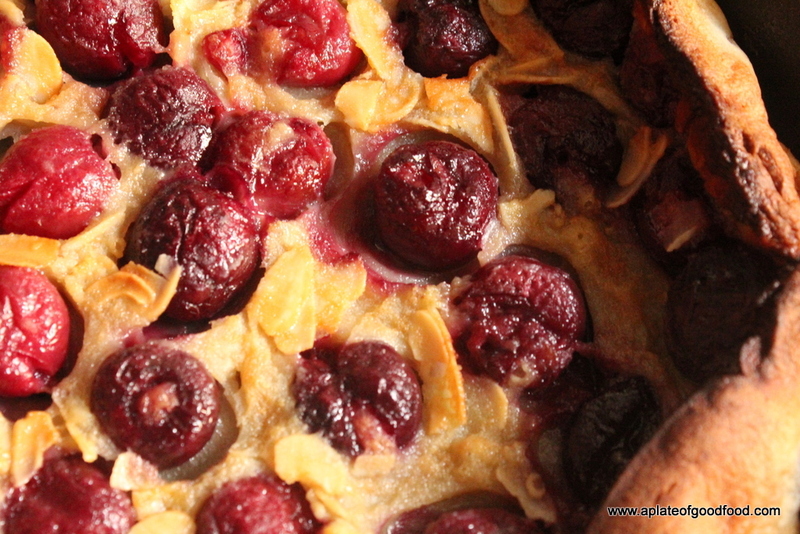 It seems that leaving the pits in the cherries is a matter of choice. I found it was easier to eat without the pits in the fruit. 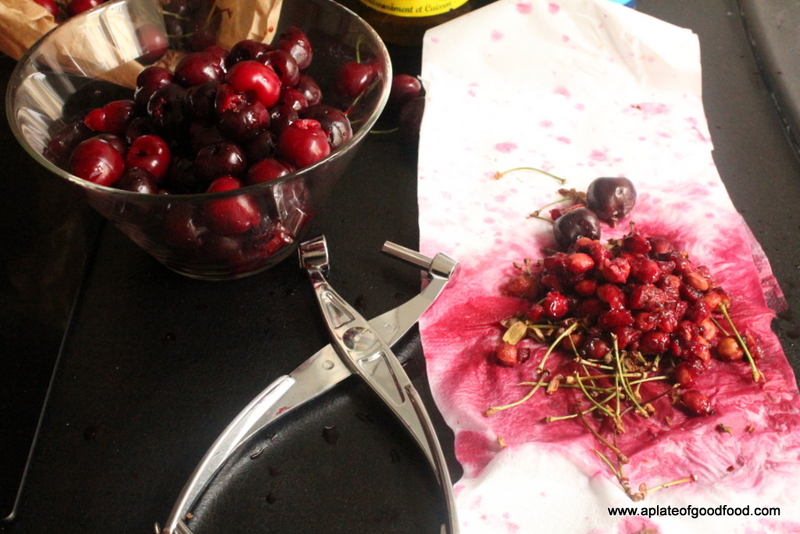 A cherry pitter is a handy tool to own if you’re planning to pit anything more than a handful. 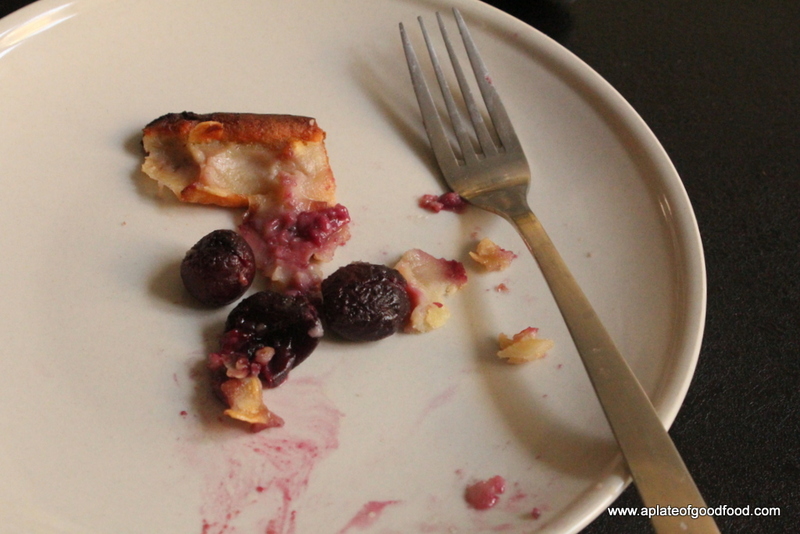 The end result was a quite light, not too sweet, almost thick pancake like clafoutis with ruby red cherries generously spread all over it. All recipes I read advised sprinkling icing sugar before you serve it. 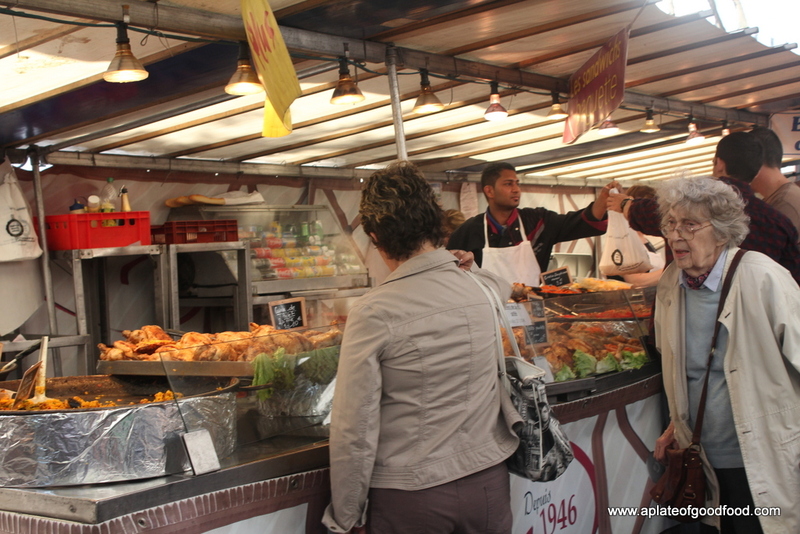 I skipped this step mainly because I do not want to leave half kilo bags of sugar behind in the kitchen but I highly recommend it if only to add that hint of extra sweetness to every bite. Preheat the oven to 180C (conventional). 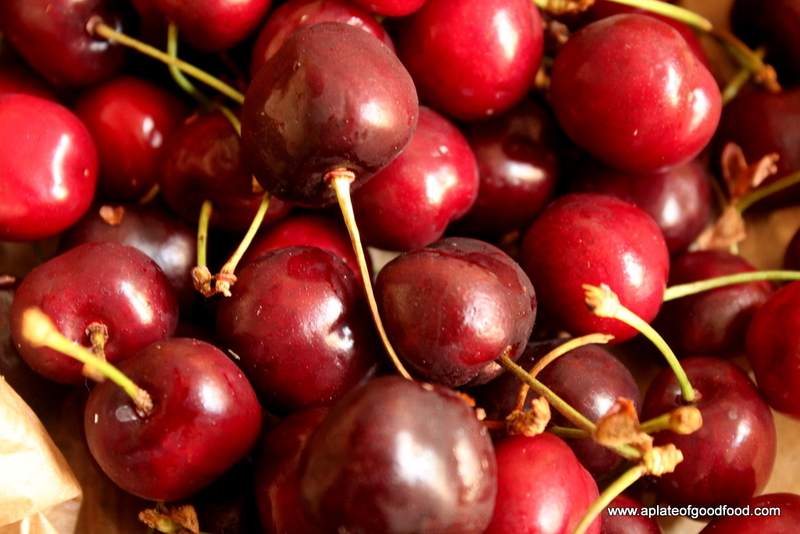 To let the cherries macerate, sprinkle a couple of tablespoons of sugar onto them and set aside. In a large bowl, beat the rest of the sugar and eggs together. Add the milk, vanilla extract followed by the flour, melted butter and almonds. 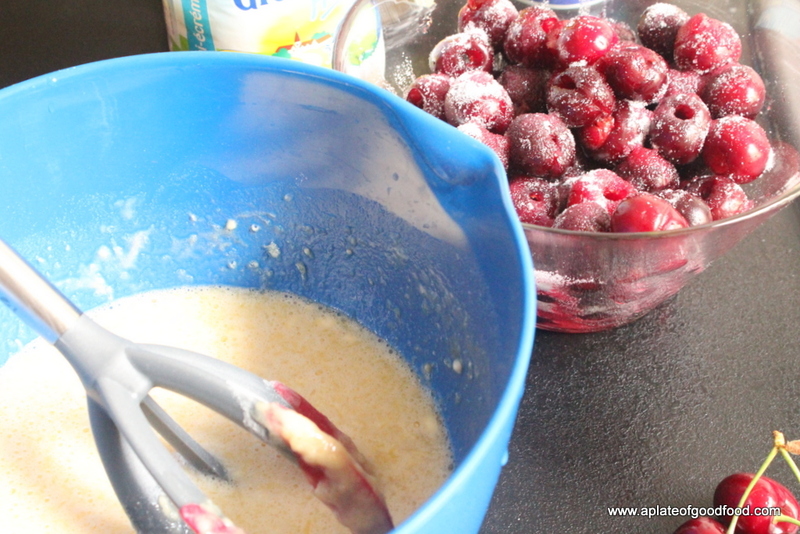 Add the cherries to this mix and pour the mixture into a lighty greased medium sized frying pan. Place the frying pan into the oven and let the mixture bake for around 35 minutes or until it is puffed up and golden in colour. Remove from oven. Let it cool slightly and serve warm in slices. 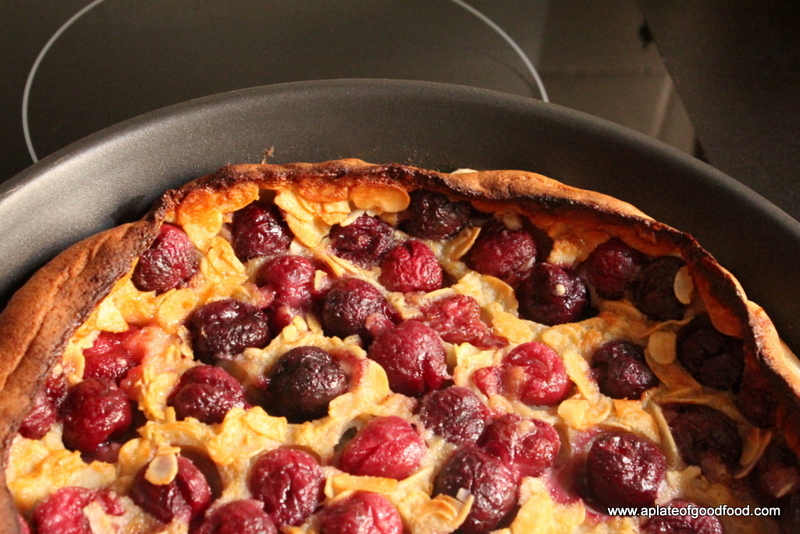 This classic French dish could make for a lovely dessert along with some rich vanilla icecream on the side. Apparently, it’s also sometimes consumed at breakfast and I think that’s a brilliant idea for something so comforting. 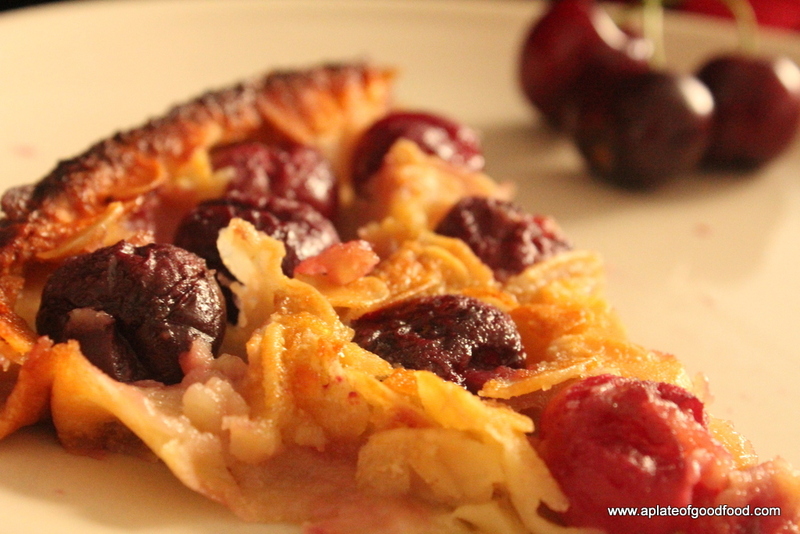 A must try with a variety of summer fruits that will soon become available.